Since then, his climb up the basketball ladder has been phenomenal, and he has emerged as one of this countryâs premier sporting characters. He was adjudged Sports personality for 2003. He has agreed to re-sign with the Golden State Warriors to a five-year contract worth $41.6 million, his agent, Lon Babby, told ESPN Insider Chad Ford earlier this month. The deal, according to Babby, starts at $6.5 million next season and has a team option in Year 6 for a little over $10 million, Babby told Ford. Contracts were not officially signed until July 14. The news came as a blow to many teams hoping to land the big man. Foyle averaged 3.1 points, 3.8 rebounds and 1.0 blocks in 44 games for the Warriors last season. 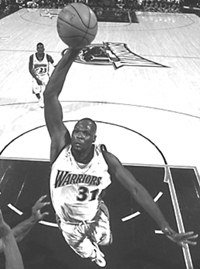 He was considered by many teams to be one of the few available big men willing to sign for the mid-level exception. However, in the end, Golden State gave him a far more lucrative deal to stay in the Bay Area. Golden Stateâs willingness to sign him to such a big contract likely spells the end of Erick Dampierâs tenure in Golden State.